Rachel Lacey was a new author to me, but I am so glad I discovered her! 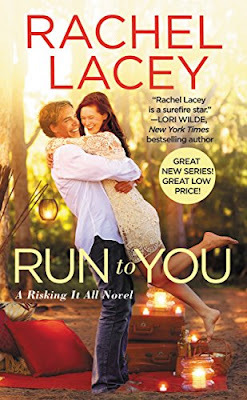 While doing research for this review, I realized she release a prequel novella to Run With You called Rock With You (just 99 cents!) so as soon as I finish this post, I'll be dashing off to one-click Rock With You and dive into it! Although this doesn't actually fall in the sports romance category, which is one of my favorite types, it does have an olympic swimmer in Ethan! I adored Ethan- he was super sweet, loyal, and caring. I loved his relationship with his childhood friends, Ryan and Mark, who were his partners in an extreme sports business called Off-the-Grid Adventures. Also special was Ethan's relationship with Dixie, his grandmother. Gabby reminded me a bit of myself, so timid and a bit closed off. A work-from-home video game developer, she was taking some time to hide away in the small town to re-set her life after a bad relationship. The difference between Ethan and Gabby led to a really interesting pairing, and I enjoyed seeing them want more from each other as they pretended to be a couple for the benefit of Dixie, Ethan's ailing grandmother. Fake relationships are a trope I tend to enjoy, especially the journey of it turning into more. Run to You certainly fit the bill, and the small town characters also drew me in. It looks like this series will continue, with books focusing on Ryan and Mark. I'm looking forward to reading more from Rachel Lacey!